Drop by to see what's on offer at the NUI Galway MakerSpace. We will guide you through the software and hardware we have available in the space and answer any questions you might have. • What’s a Raspberry Pi and what can people do with it? We are also looking for your input into what serivces we should provide in the MakerSpace. It's your MakerSpace. This event is held in the NUI Galway MakerSpace located in the library. This event will be repeated. The issue with printing has been resolved. The Managed Print Service (printing in PC Suites, Library and in a number of staff areas) is currently unavailable. ISS are working to resolve this issue as a priority and we apologise for the inconvenience caused. 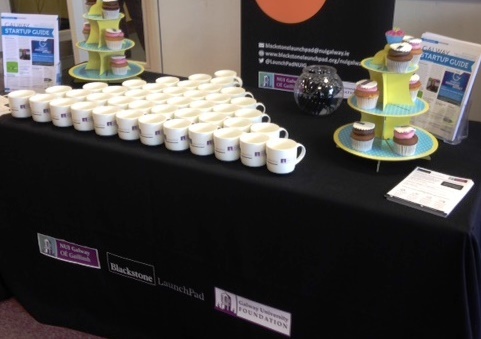 Today at 13.00 the James Hardiman Library is hosting the official launch of Blackstone LaunchPad and welcomes all associated with the Blackstone LaunchPad enterprise and their guests to the Library. The James Hardiman Library looks forward to developing many synergies between our MakerSpace activities and those of Blackstone LaunchPad. Blackstone LaunchPad can be found on the Concourse where the old Parking Office was located. It is a campus-based experiential entrepreneurship programme open to students, alumni and staff, regardless of discipline. They offer coaching, ideation and venture creation support. 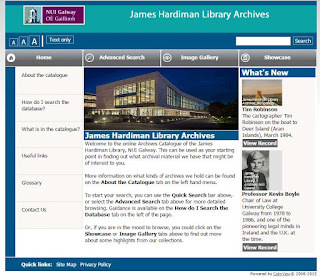 We recently introduced a new web interface through which you can browse the archives collections of the James Hardiman Library online. Here are 5 ways in which your research could be transformed by this exciting new development! 1. Archives are amazing sources of inspiration. They hold an abundance of potential research material that can be applied to virtually any discipline to create innovative research. The catalogue could hold the key to unlocking your next research project, and you will never know unless you look! 2. Even if you don't unlock your next research project, simply by browsing through the Showcase and Image Gallery sections of the page, you are certain to find out about something or someone new. 3. The enhanced search functionality afforded by this new service means you can carry out keyword searches across the entire catalogue. This means you can browse over 20,000 records from 350 collections simultaneously, bringing insights from other sources to light that you may not have considered before now. 4. The archives catalogue is one part of a new suite of tools aimed at opening up our archives. Why not look at the catalogue alongside some of our digital projects which are available on https://digital.library.nuigalway.ie/. Keep an eye out for new projects on this page, and you can still find our older digital projects onhttp://www.library.nuigalway.ie/digitisedarchives/. These will be migrated to the new system soon. 5. Finding something you are interested in on our catalogue gives you the perfect excuse to work in our beautiful reading room, located on the ground floor of the Hardiman Research Building in the heart of NUI Galway's campus. 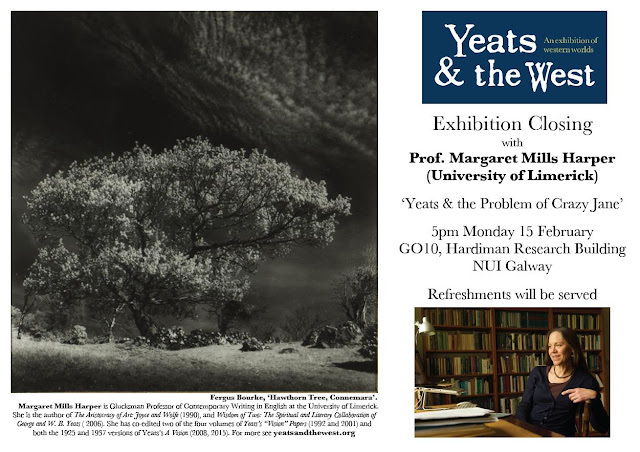 Check it out now on archivesearch.library.nuigalway.ie. Happy Browsing! There is currently an issue with access to the Journal of General Management. The provider is working on this problem, and we hope to access restored soon. The James Hardiman Library is very pleased to be hosting a Spring Networking Event put on by the Western Regional Section of the Library Association of Ireland (WRSLAI). The event will take place on the afternoon of Saturday, February 27th, and features a roster of exciting speakers in the fields of e-learning and librarianship. It will also be a celebration of the recently completed and highly successful Rudai 23 online CPD project put on by the WRSLAI. 2.00pm Frances Boylan - "The 12 Apps of Christmas: Mobile Apps and Personalised Learning"
Frances works currently in the area of eLearning Development within the Learning, Teaching and Technology Centre (LTTC) at the Dublin Institute of Technology where she supports lectures as they engage with technology enhanced learning, teaching and assessment practices. Frances also recently successfully ran the award-winning e-learning programme ‘The 12 Apps of Christmas’ with DIT. Aoife Lawton works as a systems librarian for the Health Service Executive. She recently published her first book, ‘The Invisible Librarian’, on librarianship and our visibility as professionals. 3.00pm Jane Burns - "CPD is for life- Developing Yourself, Developing Your Profession"
Jane serves on the Library Association of Ireland’s Executive Council, Continuous Professional Development Committee and the Task Force on Information Literacy. Jane is an Occasional Lecturer at UCD School of Information Studies where she teaches Management for Information Professionals and The use of Social Media in Health.Jane’s current role is Research Manager at the Health Professions Education Centre at the Royal College of Surgeons in Ireland. 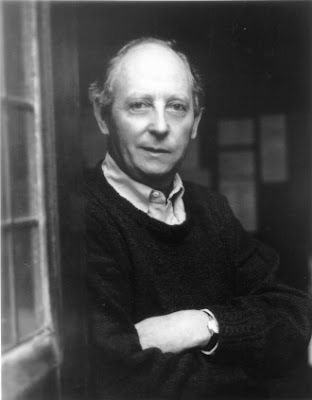 The 30th of March brings about the tenth anniversary of the passing of the acclaimed Irish writer, John McGahern. In the decade since his death, Ireland and its people, society and identity, have changed beyond recognition. One of McGahern's great achievements in hiswriting, in any of his accomplished forms; novel, drama, short story or essay, was able to get to the very heart of Ireland and especially of rural Ireland and the lives of its people. The time, place and context of McGahern's writing would be recognisable constants, vivid as any character within his writing. McGahern's writing spanned over five decades and tracked the huge social changes in Ireland across this time. The Book Show on RTÉ Radio 1 recently broadcast a feature on John McGahern, focusing on the life and career and also his archive. It was a pleasure to have the programme host, Sinead Gleeson, visit the archive here at NUI Galway and see first-hand the collected literary legacy of one of Ireland's most accomplished and beloved authors. The archive of John McGahern is held with the James Hardiman Library, NUI Galway. Deposited by McGahern in 2003, just three years ahead of his death, the archive is a literary treasure-trove that records not just the vast and prolific writings of McGahern, but also his literary relationships with other writers and offers a unique insight into the mind and processes of McGahern as both a writer and person. Such unique material in the archive includes the manuscript for The End or the Beginning of Love, the unpublished novel by McGahern, that was accepted for publication by Faber and Faber in 1962, but which was withdrawn by McGahern as he believed it to be not good enough. 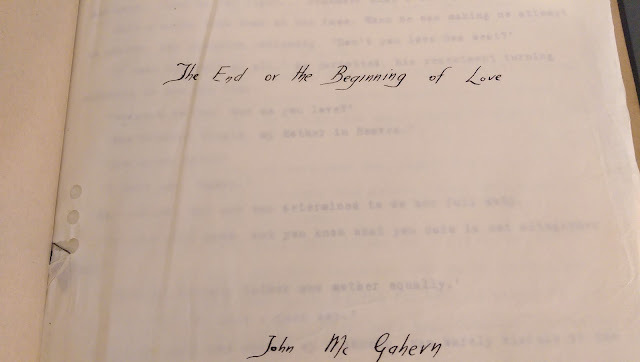 Also from this time are two letters from John McGahern to Mary O'Malley in relation to the Threshold literary journal published by the Lyric Theatre, and found within the archive of the Lyric Theatre, also within the Hardiman Library. He asks to be considered for publication although 'I have not appeared in print' (17 January 1959) and later discusses publishing an extract from one of his novels (26 June 1962). 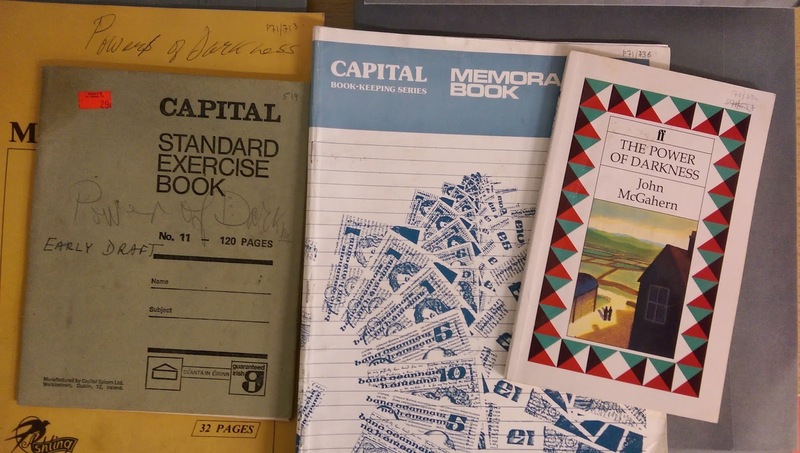 The archive reveals the private and intimate world of the writer at work. The writing style of McGahern is revealing of how he worked. 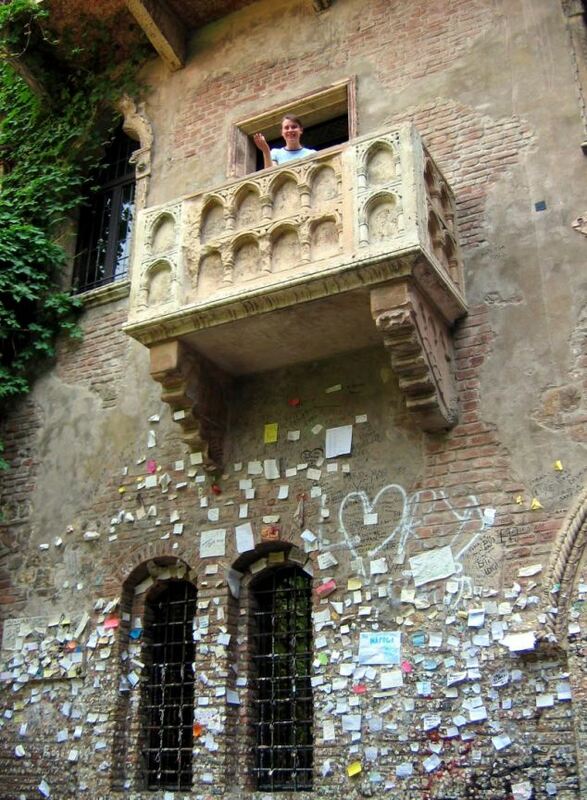 He wrote long-hand, often in coffee-stained school copy books and A4 notebooks. The scrawl of handwriting gives a sense of working on fleeting ideas that would often change and fluctuate. The number of drafts and revisions show McGahern rarely let go of an idea or a narrative completely but would often return to make changes, often to as much or as little as a single word or line, but which would bring the setting or characters or plot in a new direction. One short-story, Bank Holiday, has over twenty identifiable drafts alone. 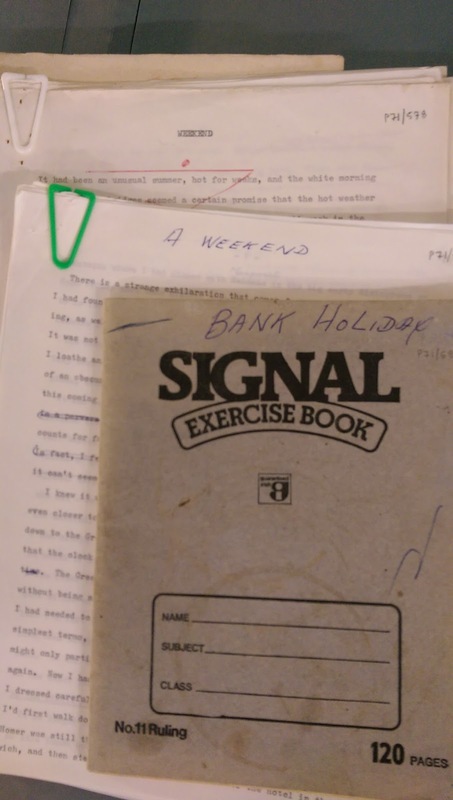 The John McGahern archive consists of forty boxes of manuscripts. 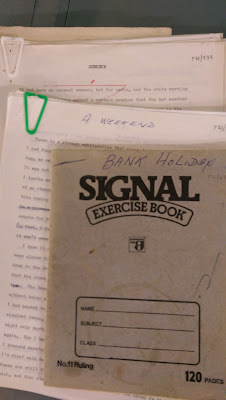 All evidence of 'the writer at work' is within this volume of manuscripts and covers the breadth of McGahern's writing in prose, drama, fiction and essay. The papers give the reader a unique and otherwise impossible accessibility to the mind of McGahern. McGahern himself said of the separate worlds of the writer and the reader: "I think each of us inhabit a private world that others cannot see" – the archive brings those two private worlds together and is perhaps the only place this can happen.